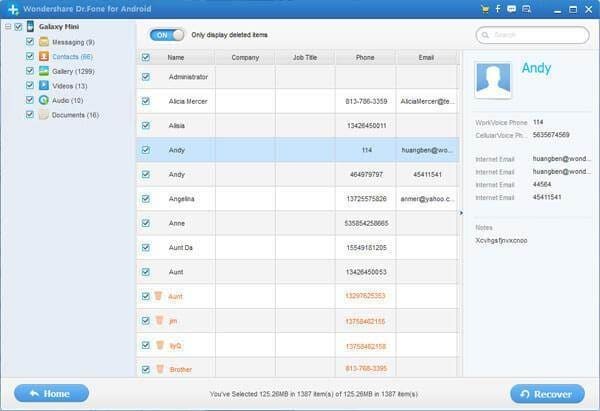 The world's first Samsung contacts recovery software - Wondershare Dr.Fone for Android allows you to directly scan your Samsung device and recover deleted contacts from it, as well as messages, photos and video. It's a completely safe, reliable and easy to use program. Encountering the loss of contacts on your Samsung device? Don't hesitate. Wondershare Dr.Fone is the great option for you. 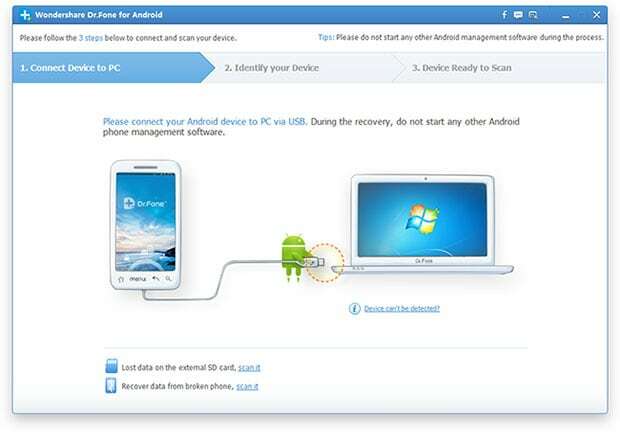 Note: Please check your Samsung device model and the Android OS here before you perform the recovery. 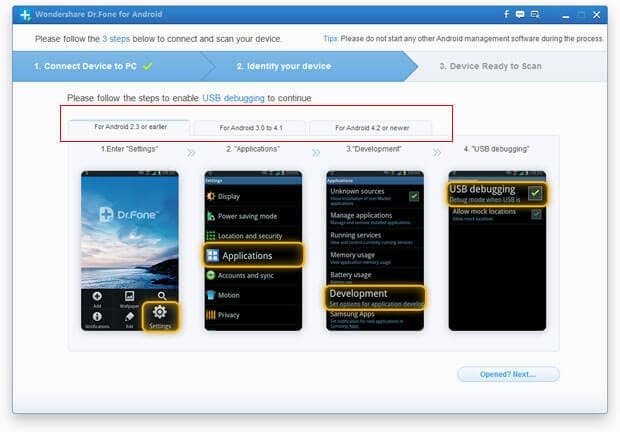 Not all Samsung devices are supported right now by Wondershare Dr.Fone for Android. Install and run the program on your computer, and then you'll get the main window as follows. Then connect your Samsung device to the computer with a digital cable. If your device can be directly detected by the program, you can move to the next step. If not, you'll get a window below. Before scan your device, the program will analyze it first. Click "Start" on the window. Make sure that the battery is more than 20% before you start, so that the analysis can be completed successfully. 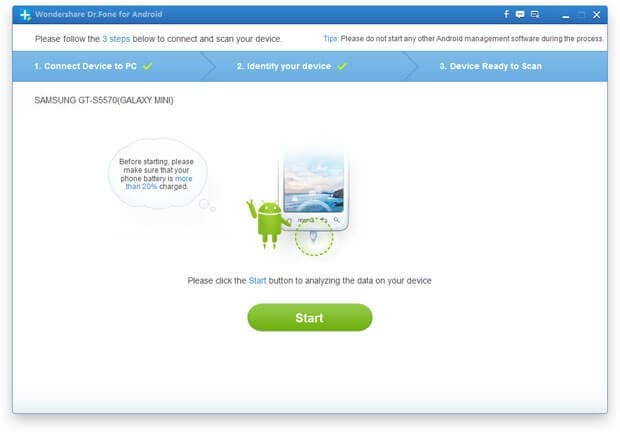 When the analysis finished, you can scan your Samsung device now. 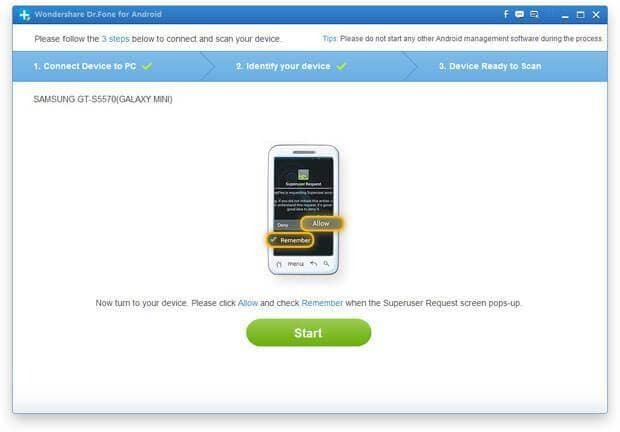 At this time, you need turn to your device and click "Allow" on the screen to allow the Superuser Request, and then back to the program and click "Start" to scan your device for lost contacts. Note: Sometimes, the "Allow" button will pop up several times. It's normal. Just click it until it won't appear again and the program starts scanning your device. After the scan, the program will generate a scan report and it looks like the window shown below. Choose "Contacts" on the left menu, and you can preview the detail. Mark those you want and click "Recover" to save them on your computer with one click. Note: Contacts found here are not only those deleted recently, but also contain those currently on your device now. They have their own color: black for existing contacts and orange for deleted ones. You can use the button on the top to separate them: Only display deleted items. Moreover, if you want to import your contacts, photos and video back to your device, you can use Wondershare MobileGo for Android.